Discovery Notes Soil was heavy with organic matter. Sample was taken approx. 4.5 in deep and near a pool of slow moving water (near stagnant). 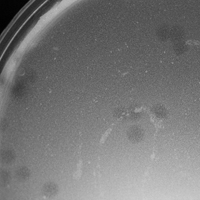 Collection site was under the shade of surrounding trees and there were plenty of animal life nearby (being a dog park), which was optimal, considering host mycobacterium is M. smegmatis.